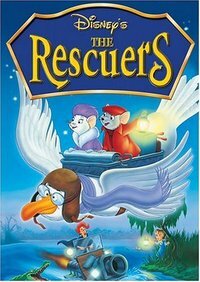 The Rescuers is a 1977 animated feature produced by Walt Disney Productions and first released on June 22, 1977. The 23rd film in the Walt Disney Animated Classics series, the film is about the Rescue Aid Society, an international mouse organization headquartered in New York and shadowing the United Nations, dedicated to helping abduction victims around the world at large. Two of these mice, jittery janitor Bernard (Bob Newhart) and his co-agent, the elegant Miss Bianca (Eva Gabor), set out to rescue Penny (Michelle Stacy), an orphan girl being held prisoner in the Devil's Bayou by treasure huntress Madame Medusa (Geraldine Page).